Edraw can create management structure chart from templates in minutes and share with anyone who uses PDF, Microsoft Word, Excel or PowerPoint. The followings are some management structure chart examples created by org charting software. The followings are some management structure chart examples created by org charting software. It supports to insert photos so that readers can connect name and appearance quickly. Custom organizational charts are also available for various options. A management structure chart, also known as management organizational chart, is a chart mainly used to show the structure of an organization and the relationships in the organization. 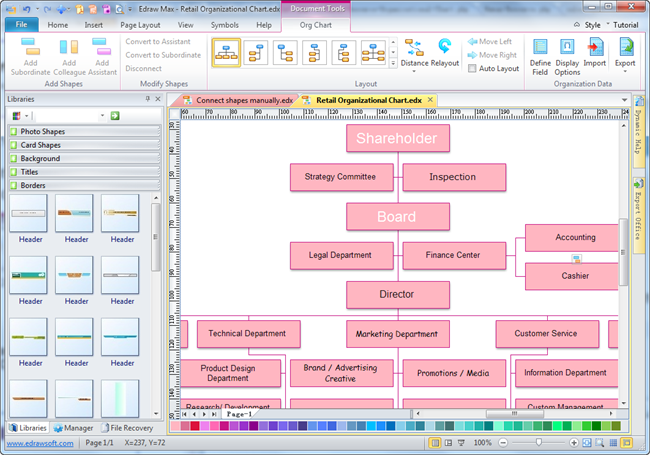 Edraw provides some smart layout tools to draw organizational charts with amazing ease. Some professionally designed management structure chart templates include hierarchy charts, matrix structures, multiple division structures and a whole lot more.